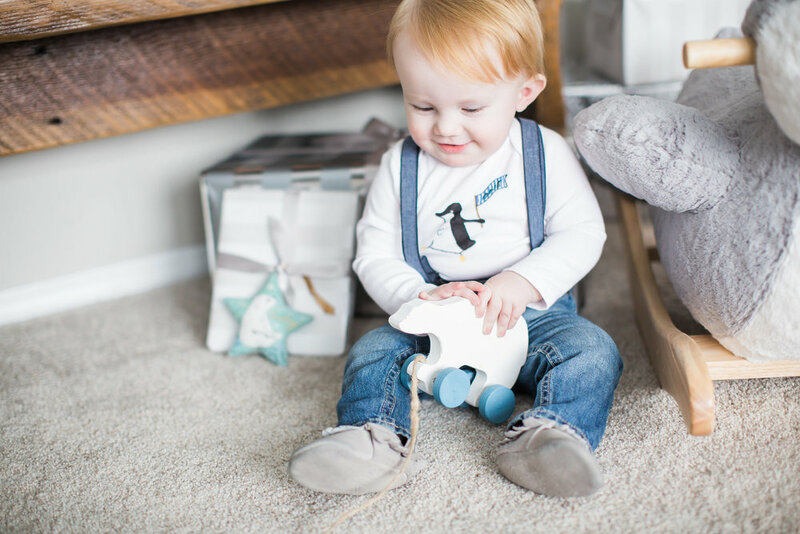 Our darling son Avery turned ONE at the end of January, and I still find myself in disbelief that we have a toddler! Here is his sweet little party that I designed! 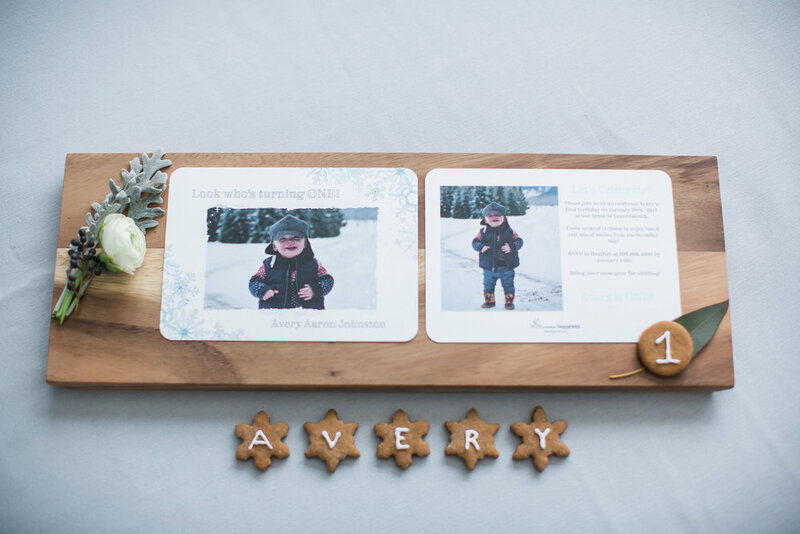 With Avery's birthday being in Winter, it seemed fitting to stick with a snowy themed party. I found these adorable invitations from Tiny Prints. I was really drawn to the watercolor snowflakes, and I loved that I could personalize them with pictures! We had just gotten quite a bit of snow, and so Avery and I went outside for an adventure. 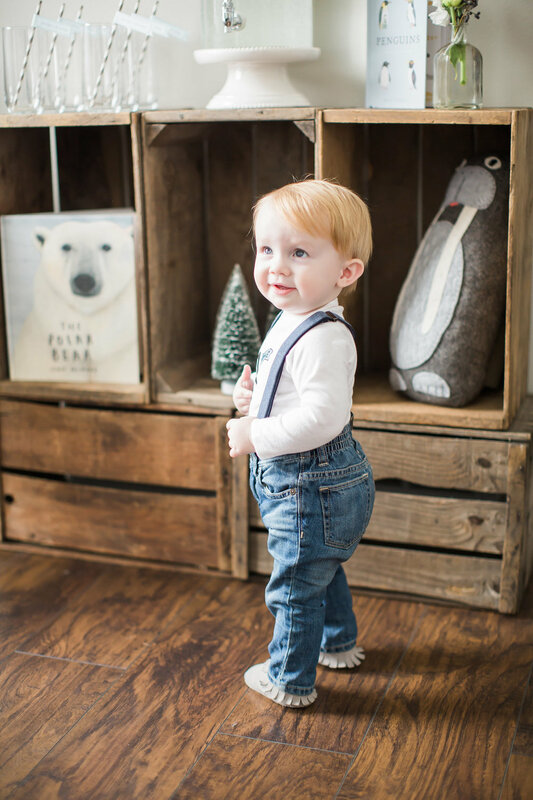 I took the cutest pictures of him while we were out - perfect for his invitations, and sure to brighten everyone's faces when they opened up their invites! 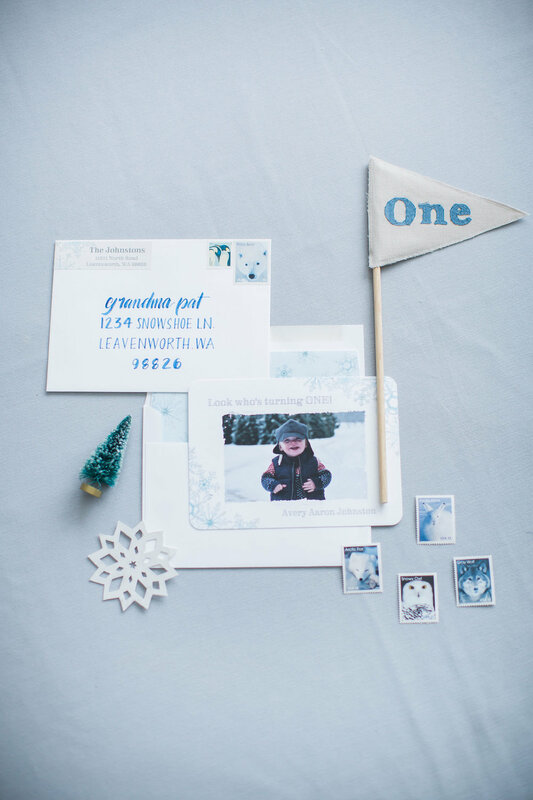 With the invitations set, and a snowy theme on my mind, I decided to turn Avery's First Birthday into an Arctic One-Derland! I decided on soft winter hues of creams, grays, greens, tans, and blues for the color palette, and added in natural wood elements throughout. Adorning the wall near the entrance of the party was an old window frame that I had recently gotten from my grandmother - and in the ideal coorelating color! I cut out snowflakes for each month, and used twine to fill the frame with photos of Avery - perfect for guests to see how much our boy had grown in the last year! A charming trio of arctic animals greeted guests as they laid down presents for the birthday boy! They were just too cute to wrap up! 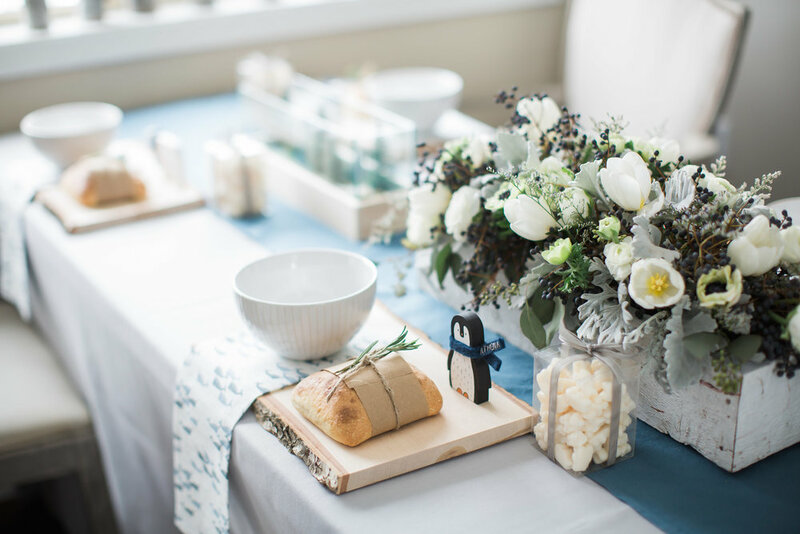 A simple and sweet drink station caught guests eyes next after they laid down their presents for Avery. Using a chalkboard that my husband Aaron had built, Chalk Chic Mama beautifully wrote out a One Year Chalkboard for Avery. I told her the theme and she came up with the most beautiful design! Her work is always phenominal! 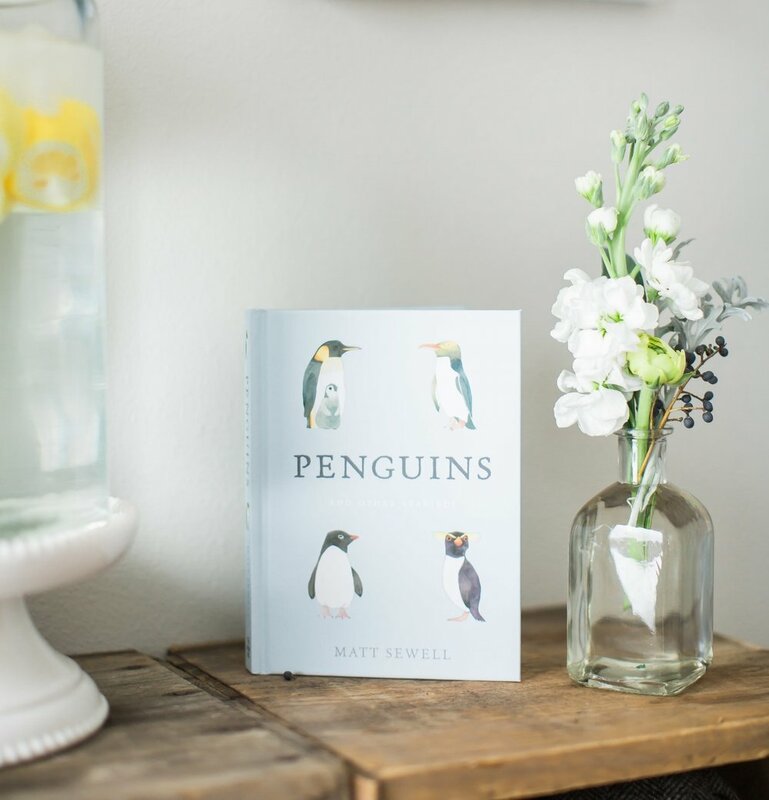 Tying into the Arctic Animal theme, I found a few books & bought them as presents for Avery, and used them as part of the decorations throughout. My Mother-in-law Jennifer made the cutest Walrus Pillow from a really great tutorial we found online here and he fit perfectly in an apple box at the drink station. Embellishing each drink glass were flags I made in the perfect wintery-blue hues. 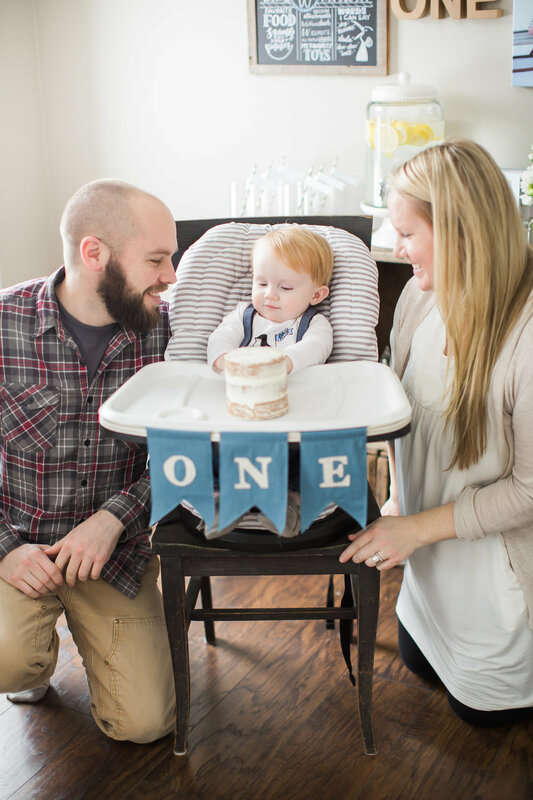 I also found just the right wintery blue colored fabric and sewed a few table runners, and made a "One" banner that adorned Avery's high chair. I really enjoy making hand-made items for my parties - I feel it really adds a special touch! and really goes a long way! 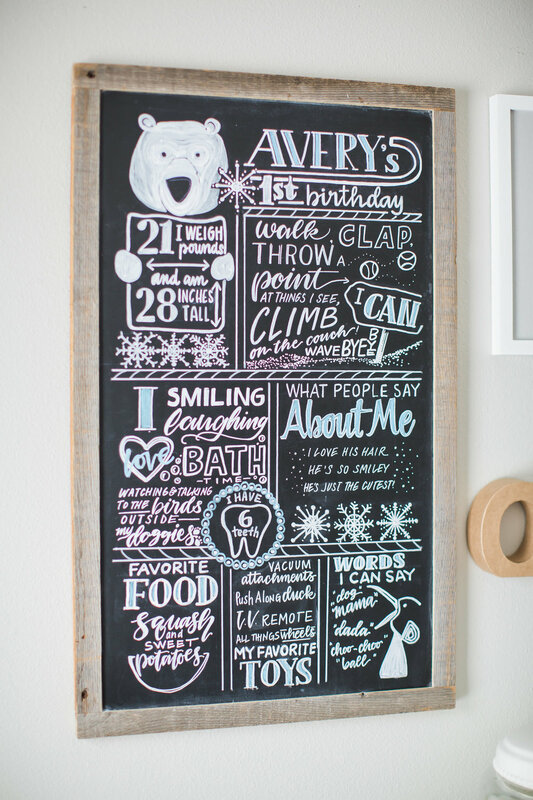 How perfect is that Chili chalkboard from Chalk Chic Mama?! 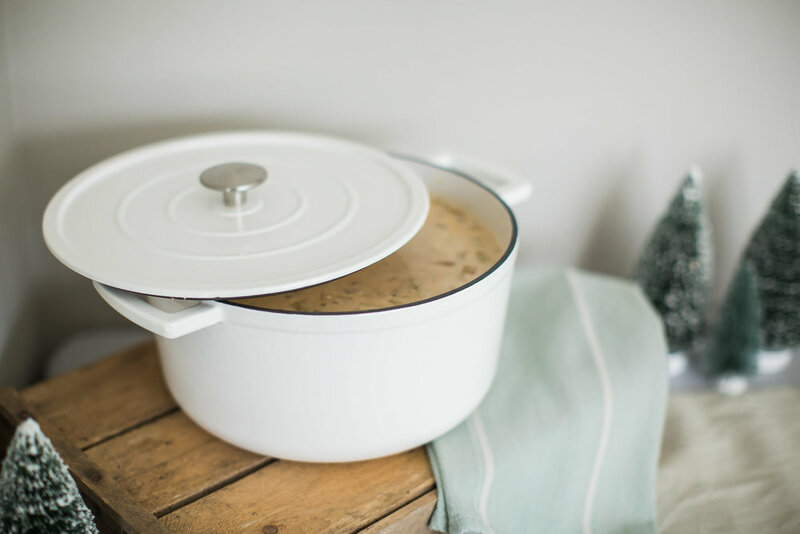 I found a really great Creamy White Chicken Chili recipe on Pinterst, and it turned out to be a huge hit! We kept the menu simple with just the chili, and added some fun topping choices, along with some fresh rosemary bread to accompany it. It's safe to say that nobody left hungry. 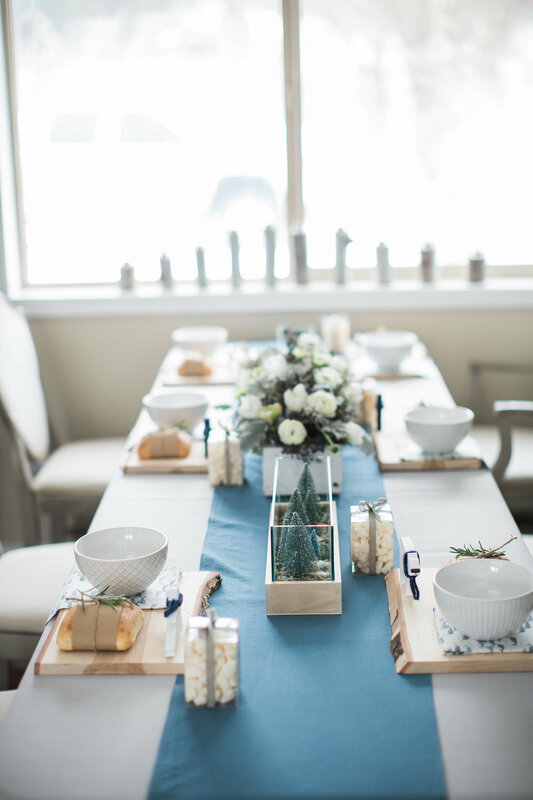 The table settings are always a favorite of mine to decorate! In addition to the runners, I sewed napkins for each guest with the cutest Narwhal pattern fabric I ever did see! Full Bloom Flowers and Plants made the most beautiful winter arrangement that sat as the main focal point on the table. 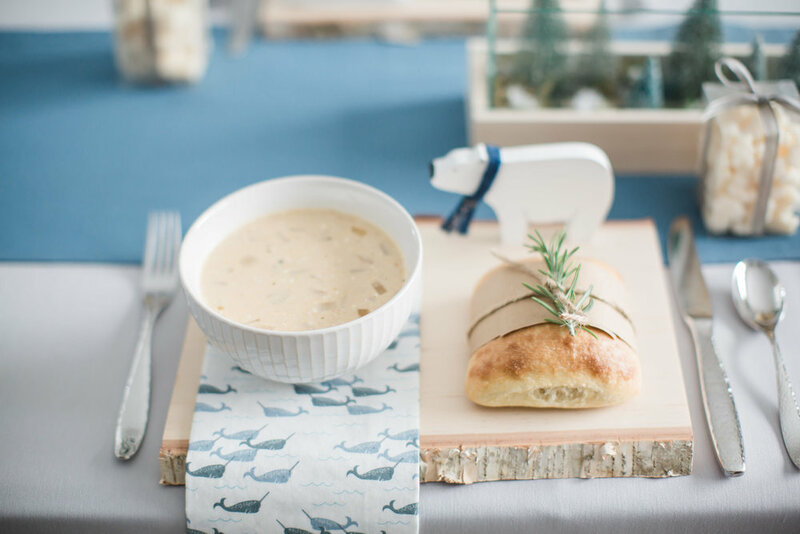 Adding a personalized touch to the place settings, I thought it would be sweet to have an arctic animal set at each guests' spot. My husband cut out penguin, polar bear, and sea lion silhouettes, which my Mother-in-law Jennifer then hand painted - I feel so blessed to be part of such a talented family! She made scarves for each animal, and then hand-stiched each guest's name on it so they could find their seat. I still gush over how they turned out! They were too cute! Guests could then take home their animal as a memento of the party, along with a box of white chocolate covered gummy bears that adorned each place setting. 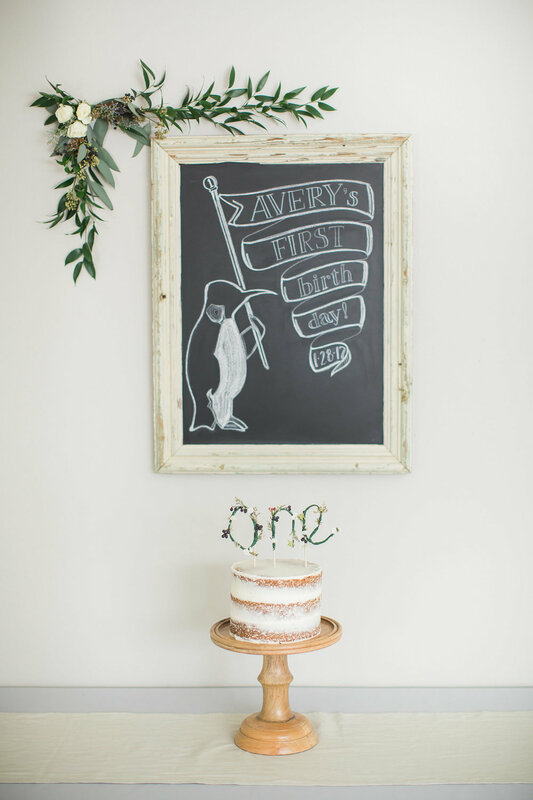 This might be the sweetest chalkboard I ever did see - although I feel I say that about every chalkboard Chalk Chic Mama designs! Pure magic! 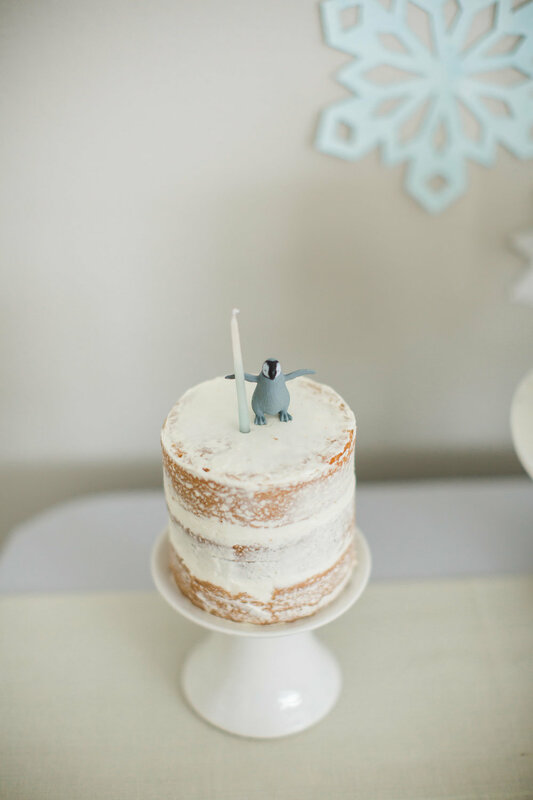 Wintery white cakes from Cupcake Blues created the perfect snowy scene on the dessert table. I'm a sucker for naked cakes, and so I knew right away I wanted a few of those - and using one as Avery's smash cake was the perfect choice - as I was a little leery of him having a sugar overload on his birthday. One of my favorite things to do when planning any event is to find unique items that add such a special touch to the party. Grace Rains Paper Co. masterfully hand painted an illustration with Avery's name on it. 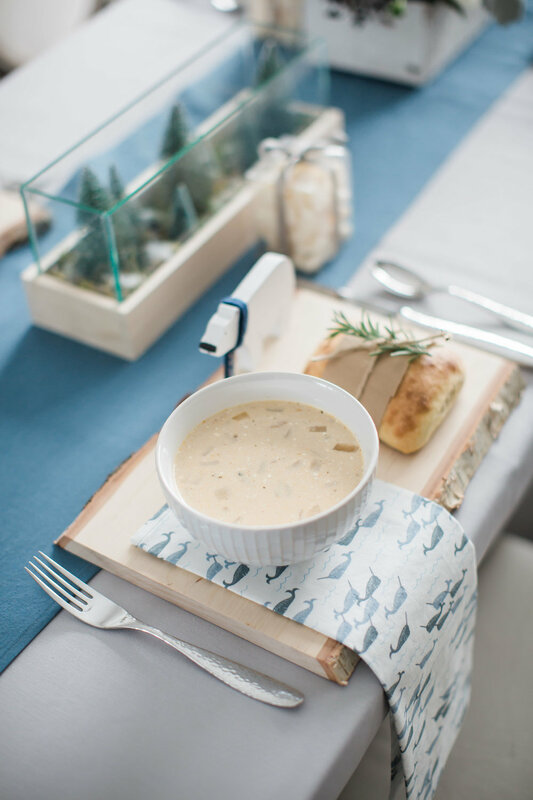 She used acrylic paint in a watercolor style that matched our arctic theme seamlessly! "Poppy the Polar Bear" from Afternoon Faun. I just know Avery will love and treasure him for years to come! And how cute is this Polar Bear pull toy that my husband made?! We ended the day in the perfect way - with a sink bath! 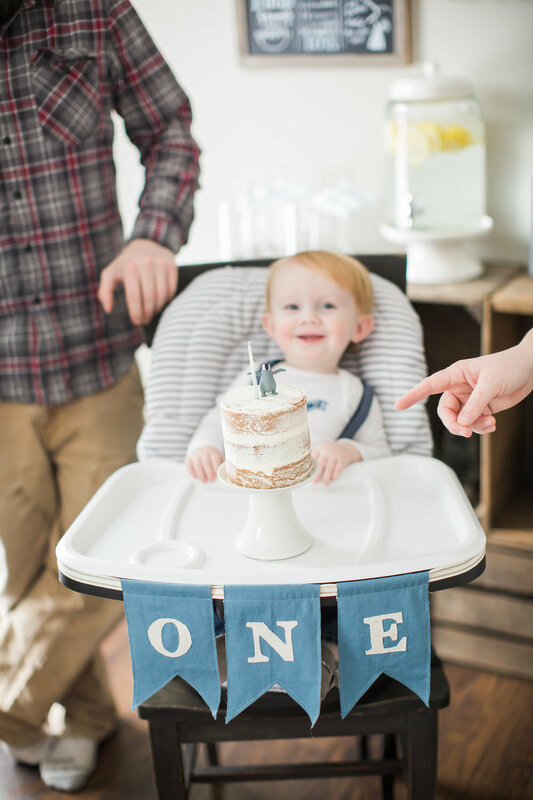 Avery's First Birthday Party was so sweet, and filled with lots of handmade items made with love by family. It was a party he most likely will not remember, but because of these remarkable photos from my dear friend Nicole Conner Photography, he will be able to look back on this day fondly, and definitely feel loved. Watercolor Illustration: Grace Rains Paper Co.